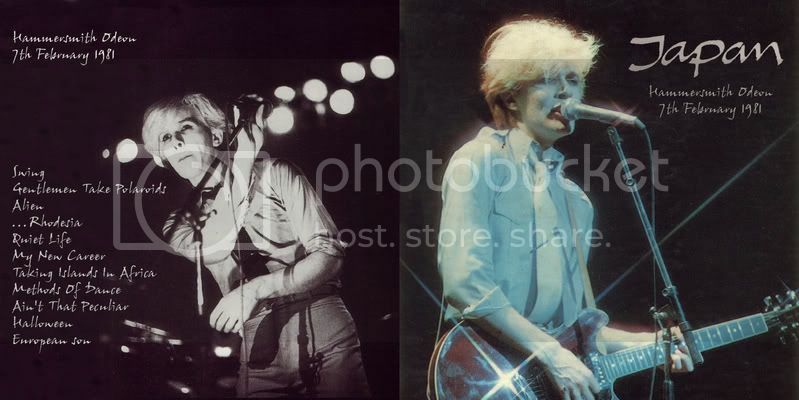 Japan, 7th February 1981, Hammersmith Odeon. Radio broadcast. Bootlegged as Polaroid, Methods Of Dance, etc. Much bootlegged. There is some Silver CD bootleg art out there but this artwork is mine. Excellent quality recording from the broadcast. I'd originally uploaded this at Dime ages ago, then at Demonoid but it's upped here on a registration free tarcker. Enjoy! I'm pretty sure I have it. I'll look for it and upload it soon. lastgoldstar wrote: I'm pretty sure I have it. I'll look for it and upload it soon. "...And love blows through Rhodesia ..."
I am still seeding this you know! It's in FLAC format, so if you need help decompressing that back to WAV files let me know. You'll like this, I think it's the best thing I ever recorded! What is the best way to convert the FLAC files down to WAV files? You need to download a small programme. I use FLAC Frontend. Just google it. Its pretty straightforward to use, and totally free. for some reason I can never get these downloads to work, could anyone give me some help? If you send me a pm explaining what problems you're having I'll try and guide you through it!